Janesville Farmers Market » It’s Pickle Time! Isn’t summer great? You can get so many different wonderful vegetables at the farmers’ market in the middle of summer. Many of the vegetables, such as carrots and beets, can be purchased fresh and stored for several weeks in your refrigerator. Others, such as cucumbers and herbs, must be used rather quickly. One very popular way to preserve cucumbers is making pickles. There are three basic ways to make pickles. The three main methods of pickling cucumbers are salt brine or lactofermentation, vinegar brine (usually used with canning) and refrigerator. Each method has numerous recipes and variations. Some people prefer their pickles more spicy. Some like them more sweet. Some like garlic or different herbs. Others prefer simply dill. When you make your own, you are free to choose your own favorite spices and characteristics. Slice two pounds of cucumbers and alternate with thinly sliced onions in a large glass bowl. Sprinkle the slices with salt, place a plate on top and refrigerate overnight. (Many online recipes omit this step, but Grandpa swears by it.) The next day drain and rinse the cucumber and onion slices. Mix together and boil 1 – 1 1/2 cups sugar, 1 cup vinegar (I use cider vinegar), 1 cup water, 1 teaspoons salt, 1/4 teaspoon pepper and 1 1/2 teaspoon celery seed. Cool liquid and pour over cucumber slices. Transfer the mixture to jars and place in refrigerator. You may begin enjoying these cucumbers the next day. They must be stored in the refrigerator rather than canned. They will keep for six weeks at or slightly below 41 degrees. What is your favorite pickle in the grocery store? Mine is Bubbie’s Pickles hands down. They are spicy and crunchy with a taste that is garlicky and not vinegary. This is because they are made with lacto-fermentation rather than vinegar. What is lactofermentation? I’m so glad you asked. Lactofermentation occurs when you encourage the growth of beneficial lactic acid bacteria and discourage bad bacteria that would cause the food to spoil. The lactic acid bacteria actually consume the sugars in the food and produce beneficial acids that naturally preserve the food. Some common lacto-fermented foods are yogurt, sauerkraut and kimchi. These foods are gaining attention because they help our digestion and immune systems by increasing the beneficial bacteria in our intestines. In vegetables, salt is typically used to deter the harmful bacteria that would otherwise cause spoilage and nasty flavors. There are ways to use less salt, but they typically involve inoculation with a lactic acid bacterial culture, which you may buy online or at your local health food store. Wildfermentation.com has some great information about how to make these very traditional and very yummy pickles. If you want to make yours really taste like Bubbie’s Pickles, try this copycat recipe. I made some last year that lasted for a long time in the refrigerator and even stayed crunchy, thanks to the addition of horseradish leaves, which provide natural tannins. You may also use grape leaves or even oak leaves. If you lack root cellar or refrigerator space and/or have enormous amounts of cucumbers to store, you will want to learn canning techniques. Fortunately, classes are available locally, including one from the Rock County Historical Society on September 7th. You may also find canning directions online in this link and several other places. 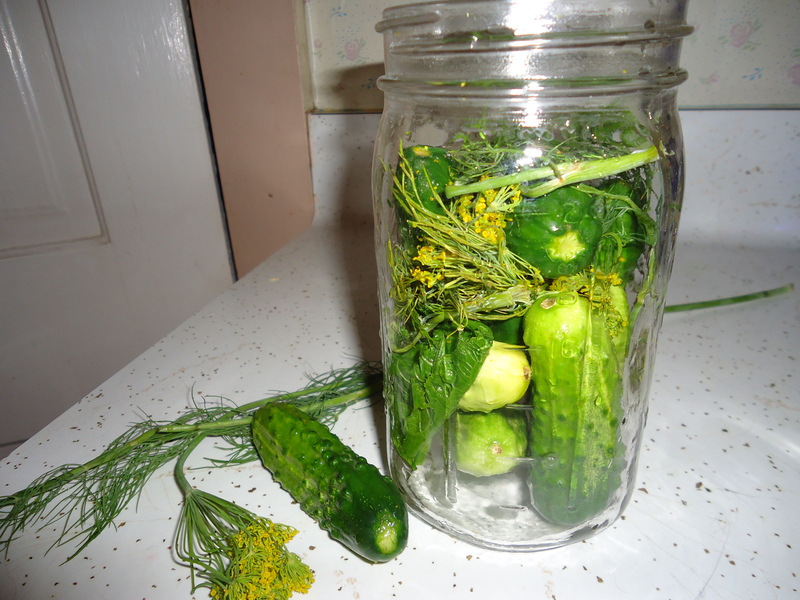 Preserving food through methods of pickling and canning are very safe when done right. They can extend your enjoyment of locally grown foods well past the summer months and sometimes into next year’s harvest season. I encourage everyone to try at least one method of food preservation. When you are in your kitchen, really pay attention to the full range of sensory experiences. Feel the slippery cucumber slices, smell the fresh dill, taste the pickles at every stage of the process. Of course, if you don’t enjoy spending extra time in your kitchen, you can often find pickles at the farmers’ market as well. What is your favorite pickle?